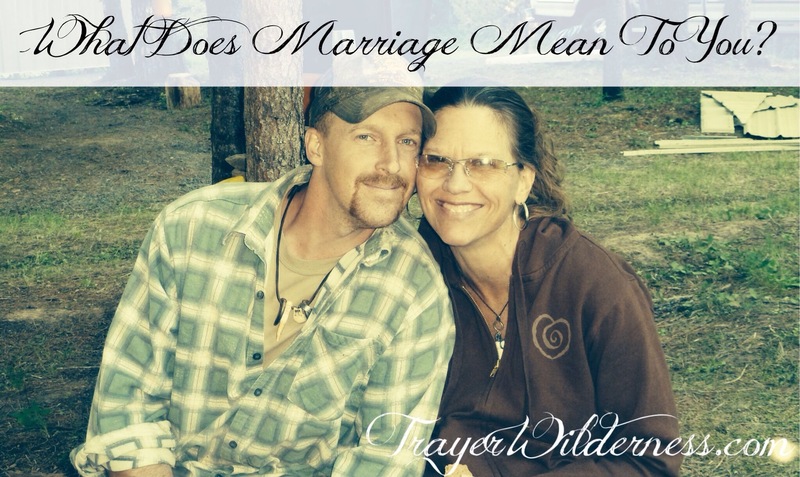 Marriage – What Does Your Marriage Mean To You? Marriage is something I hold near and dear to my heart and take VERY seriously! 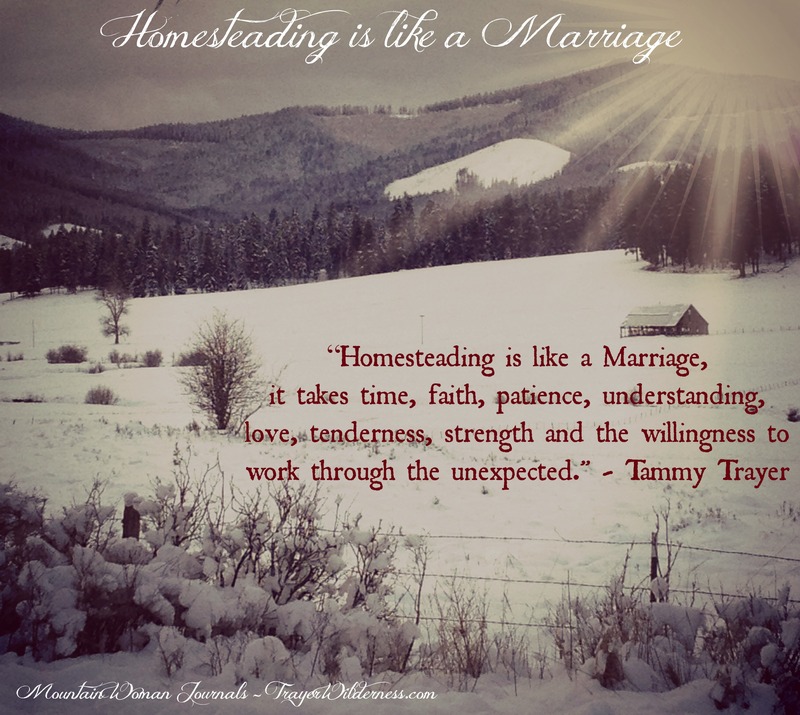 Previously I did a show on my Mountain Woman Radio titled – “Homesteading is like a Marriage”. The bible is the handbook the Mountain Man and I use as the foundation of our marriage. Our wedding vows will never be disregarded and we both have the trust in our relationship with each other that there will never be concern of adultery or divorce. Those are just not an option. This does not mean that we do not have struggles here and there, but it means that we are determined to work through our struggles and to be good to one another offering respect, guidance, love, kindness, forgiveness and trust to one another. We do not go to bed angry, we take the time to work through our struggles and listen to one another. This is something that you may need to work at and it may not always come easy, but it is worth the effort. Society today is programmed to just give up and move on. Divorce is an easy out, cheating on their spouse is so often displayed as ok, but this is really not so. No one said that life would be easy, but my husband and I were raised in the regard that you NEVER give up on ANYTHING. You apply yourself and give all of yourself and if you fail, you try, try again!! Treating your spouse with respect and putting them before yourself can build such an amazing bond between two people. When each of you gives of yourself freely with the intention of pleasing the other and not expecting something in return you will build such an amazing relationship – one that will stand the test of time! Something else that I LOVE about my relationship with the Mountain Man is that I can pray freely with him. Honestly, today I can say that I can totally be myself in front of him which provides a comfort like no other so being able to pray in front of him or needing to pray with him when we have a need or a struggle or most importantly to offer a prayer of thankfulness for ALL the blessings that come our way and for what God is yet going to do in our lives is an amazing gift that he offers me and I him. Every day we eat our breakfast and then start our day with a devotional that not only he and I participate in, but so does our son and even any guests that may be joining us which is usually continual! ha… But we take that very seriously, in that our days are so much better when we start it with God asking him to lead the way for our day and guide us in everything that we need to accomplish that day and to keep us safe in all things because we are always doing strenuous manual labor often in traditional and primitive fashions which are often more dangerous. He takes care of us and he truly guides us and blesses us beyond our wildest dreams! The book we use for our bible study is called Jesus Calling by Sarah Young (which was a gift given by my dear friend Rachel and this is a gift that keeps on giving and giving) and we also use the Jesus Calling: 365 Devotionals for Kids as well. What we do is have the Mountain Boy read his devotional for the day and then I read from my book. They are on the same subject, but worded a bit differently and it poses great conversation and perspectives on the same subject. We gain a lot from this book – so much that this is our 2nd year using the same book and it is endless knowledge gained and it always seems completely on topic for things that are going on for our family! I highly encourage these two books and I feel this is such a great gift for friends, family, children and grandchildren. Are there things you can do personally to improve your marriage? Do you pray together as husband and wife? Do you take your struggles, needs and blessings to God in prayer? Do your children see Godly parents? Below you will find some outstanding links, resources and references and a 2 part video bible study that we we feel is a FANTASTIC resource for you to do together! We have been following Cody with his YouTube channel WranglerStar for a long time. I have been trying to hook up with him for an interview on my radio show, but he is one busy man. So hopefully in the not to awful future I will be able to have him join me so he can share his story and his faith with you. In the meantime though, PLEASE check out his channel and be sure to watch/listen to the 2 part series titled Keys For A Happy Marriage with your spouse or even your future spouse. The Mountain Man and I greatly enjoyed the series ourselves and feel that it is a great tool for all marriages no matter how little or how long you have been married. Cody shared what I feel is an amazing resource when he shared the Bible Study notes that he was using which can be found here. The Bible Study notes came from a website called AmazingFacts.org. I encourage you to check out that resources as well as these: FocusOnTheFamily.org, FaithHappenings.com, KLove.org and MoodyRadio.org. Here is a great resource for your children which will provide them with amazing Christian content: http://whitsend.org which is also part of FocusOnTheFamily.org. I hope that you have gained something from this post and I encourage you to put God 1st in your home and to take time as husband and wife to fellowship and pray together. Our lives are SO amazing because we put God 1st and share a respectful God led marriage. God is in our home and we can see his hand and SO SO many blessings. May you enjoy the same and may your lives be richly blessed! Jenna thanks so much for sharing that… I totally agree with you – we start our day with devotions and prayers and we are committed to letting God lead our family and marriage. We too are not perfect, but when you focus on God and let him lead you stay on the right path and have a better and strong love for one another I feel…. My Mountain Man is my best friend…. 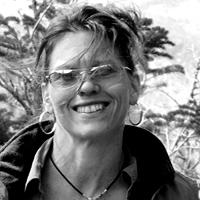 Blessings lovely and so glad to have the opportunity to get to know you better….